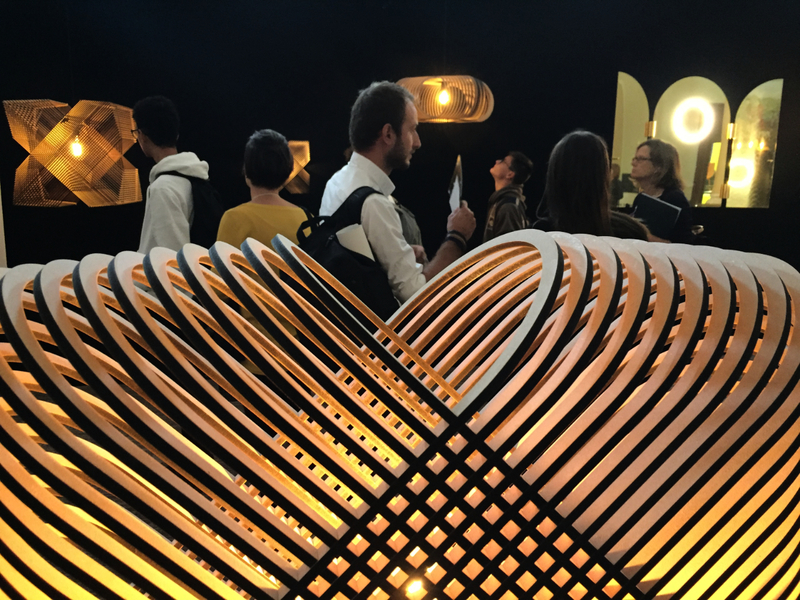 Light designer Alex Groot Jebbink took part in the exhibition Enlightened Design III during the London Design Festival 2018 in the Olympia Room together with Marc de Groot, Jacqueline Harberink, Jesse Visser, and Margaret van Bekkum. The latest version of the Angles light object is called Angles XL. A fascinating lamp in which can get lost, similar to M.C. Escher’s ‘House of Stairs’. This intriguing illumination resembles a maze, a labyrinth of repetitive forms, a spatial optical illusion, and is almost psychedelic. Nevertheless, Alex Groot Jebbink uses only a simple form in which the power lies in the repetition of that simple form. Using as little material as possible – four plates of MDF of only four millimeters thick – he tries to create as much volume as possible with precise, dimensionally stable laser technology by assembling rectangles in a specific way, like a building made of Lego blocks. It results in an impressive new image with a great deal of depth, in which a single light source casts unusual and poetic shadows on the surroundings. Groot Jebbink, who believes that astonishment lies in the repetition of a simple form, calls it magic when you are able to tell a simple story in which materials, shapes, light, space, technique, and coluors are the chapters, without losing sight of the essence. He uses his background as a mechanical engineer, interior architect, and furniture designer to realize his new lighting objects, both standing and hanging: the Lamp / Ovals XL and the Lamp / Angles XL. Ovals consists of forty laser-cut oval shapes, Angles consists of numerous rectangles that are connected to each other with the same half-timber connections, as is customary in interior architecture. The architect’s style can be found in these spatial lighting objects; he certainly surprises us with this atmospheric mini-architecture.